With Hermann Binder we have just completed the restoration of the 1788 Johannes Prause organ in the Lutheran church at Richis/Reichesdorf Romania. The final stages have apparently taken a long time to sort out, and our visit was intended to act as a catalyst to the completion of the project. 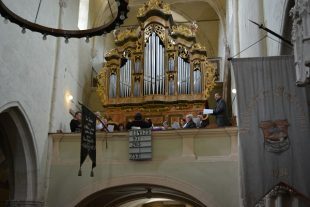 Here the choir from Mediasch are singing at the inauguration service and concert.